Mercer clinic is supported by generous donations of individuals like you! On this page are all the ways that you can support the clinic’s operation so we can keep helping our community be healthy! You can also support our Holiday Pet Basket Program, by clicking here! The most convenient way to support us is through a direct, secure donation via the PayPal website! Click the button to the right to donate. Downloadable flyer/donation form (click here). Another way that you can easily help out with our ongoing operation of the Clinic, is to sign up for the Amazon Smile charity donation program. All this does it take your existing amazon account (prime, or normal), and donates 0.5% of all eligible purchases to the charity of your choice (of which Mercer is an option). All you have to do is go to smile.amazon.com and on your first time it should ask you to pick a charity. If you type in Mercer Veterinary Clinic into the search bar it will come right up. If you are already donating to another charity through AmazonSmile and would like to switch to Mercer, you can go to My Account - Change your Charity. The main thing to remember is that when making your purchases you want to sign into/go through smile.amazon.com instead of just amazon.com. You can also use our direct Amazon Smile charity link! You can support Mercer Veterinary Clinic for the Homeless free just by shopping online! 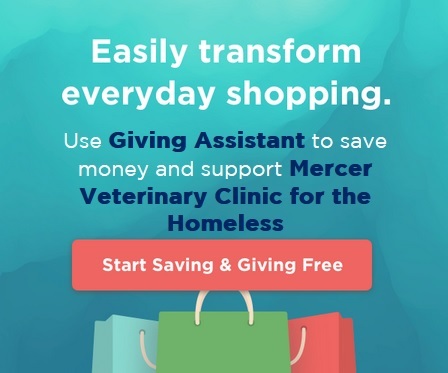 Use Giving Assistant to shop at 3,000+ popular retailers including Aliexpress, ULTA, and Gap, and they’ll donate as much as 30% of your total purchase price to Mercer Veterinary Clinic for the Homeless. It’s never been easier to donate! Give back while you get cash back! Donate 3-30% of your purchase price at JC Penney, Joann, and Aliexpress to Mercer Veterinary Clinic for the Homeless. Just sign up for free at Giving Assistant! If you are interested in getting a Scrip Card, please fill out this form and we will drop one off in your mailbox if you are part of the UC Davis School of Veterinary Medicine, or send one in the mail. If you have additional questions about donations, please email us at mercerclinicpets@gmail.com, or leave a message at (530) 752-1143.